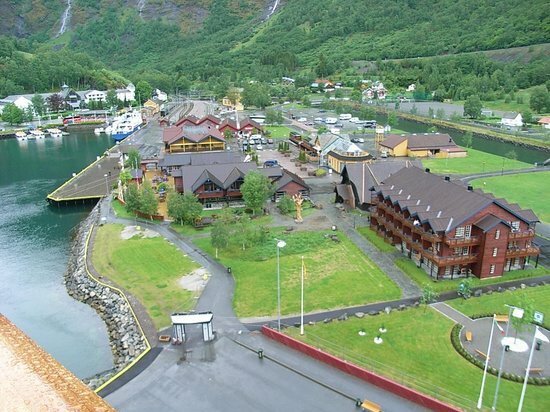 Beautiful and tiny Flåm is situated in the innermost part of the Aurlandsfjord, a tributary of the 204 kilometers long and up to 1308 meters deep Sognefjord. Surrounded by steep mountainsides, roaring waterfalls and deep valleys, Flåm is a paradise for everyone looking for a one-of-a-kind experience with nature. Large cruise ships in the harbor are a daily sight throughout the spring and summer months, and it is only a short walk from Flåm Port and the many fjord boats to a trip on the Flåm Railway. Sometimes ships use their tenders to get you ashore, which takes more time to get you to the train station. The over 65 year old Flåm Railway is widely known as one of the world's most fantastic stretches of railroad. On this amazing journey, you will experience a climb of nearly 900 meters from fjord to mountaintop, an incline of one to 18, a tunnel that twists in a spiral inside the mountain, and a view that will take your breath away! The train stops for about 10 minutes at the waterfall on the way up and down to all photographs from the viewing platform. If you are going up and down on the same day – take your photograph on the down trip as everyone gets off on the way up! As a private branch line of the Bergensbanen railway, the Flåm Railway runs 9-10 daily departures in the high season from May to September and 4-5 daily departures the rest of the year. The cruise ship will offer a shore excursion for the railway but it is easy to get your own ticket from the station. All the tours are first thing in the morning but after 2pm the made rush has come and gone and as long as you leave 3 hours in case of delays you can do this yourself – same train, different carriage. The cruise tour carriages can be packed! The view is dependent on the weather; it can be foggy first thing in the morning so book any trip accordingly. You can learn more about the exciting history behind this 20 kilometers long stretch of railway by visiting the Flåmsbana Museum in Flåm. This museum is free and should not be overlooked. It has a small gift shop at the front with reasonable pricing and then displays of rooms; a toy train collection and large full scale real trains. Its well worth a visit. Please check if other ships will be in port that day. If so either buy your train tickets in another port in advance i.e. Oslo or sign up for a ship organized tour. This train sells out quickly. The rest of the village is small and easily accessible on foot. There are a number of shops and restaurants around the train station but there is also a COOP supermarket with good pricing and a beach and pier near the caravan site. RallarToget is a cute road train that takes you on a sightseeing tour around the beautiful village of Flåm. Many scenic tours are offered by public busses and ferries. The Norway in a Nutshell tour combines a ferry, bus and trains for a spectacular day. Bikes are available to rent from the tourist office. RIB motor boat tours can be booked around the pier near the caravan site. There are a number of walking trails up the mountain; route maps are free from the tourist information office. There's an Internet cafe located in the train station. Most public libraries have free public access to the internet. WiFi is in many spots (not free).